Bruce Jenner after surgery. E! News. Bruce Jenner--a guy who gave the keynote speech at a tanning industry conference last year--has been diagnosed and treated for skin cancer. Unfortunately, he's also been spreading misinformation that belittles the dangers of melanoma. In an E! News article, Jenner is quoted saying: "I was diagnosed with a form of Melanoma called Basal cell carcinoma and have undergone Mohs surgery to remove it." Basal cell carcinoma is the most common form of skin cancer, with approximately 2.8 million cases diagnosed per year. Basal cell carcinoma is classified as a non-melanoma skin cancer. Although it can be pretty disfiguring, it's hardly ever life threatening. Melanoma, in contrast, is much less common, but it's much more dangerous. Many melanomas cannot be treated with Mohs surgery. They require more extensive surgeries, and patients often require lymph node removal and other treatments if the cancer has spread beyond the initial tumor. In 2013, it's estimated that nearly 10,000 people will die from melanoma. Last week, I had a really fantastic phone conversation with Mary Tripp, Ph.D., M.P.H., a researcher from MD Anderson Cancer Center who is leading a new melanoma prevention initiative. In her opinion, one of the reasons why people downplay the dangers of tanning beds is that they mistake melanoma for other skin cancers. "A lot of people will know friends and family with squamous and basal cell carcinomas, which are not as dangerous," she said. "But melanoma is a major cancer." I think that statements like the one made by Bruce Jenner help perpetuate the misconceptions that skin cancer isn't a big deal and that tanning beds aren't something we need to be worried about. 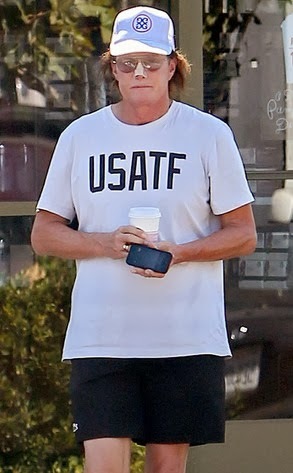 I hope that Mr. Jenner gets better soon, but that he learns more about the different types of skin cancer, and that he actually does try to take better care of his skin. How stupid is he - posing as a melanoma patient?? He doesn't have a clue. Totally not the same, maybe he should get educated!! dimensions to a curious fish.